Adds 0, 1, 3, 5, 5, or 7 to the team's roll. 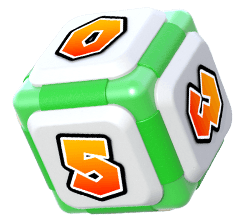 The Flutter Dice Block is Yoshi's special Dice Block from Mario Party: Star Rush. When players have Yoshi as an ally, he can roll a 0, 1, 3, 5, 5, or 7 to add to the player's total roll. The Flutter Dice Block has a similar pool of numbers to Mario's Super Dice Block, except that the Flutter Dice Block can roll a 3 and two 5's instead of a 2 and a 5 or 6, making its rolls more consistent towards the middle range. In Super Mario Party, a Dice Block known as the Yoshi Dice Block rolls similarly, except it has two 3's instead of two 5's.